How to setup a file that our laser can work with? Choose the size of the material you want to use. The file contains the margins and colors you can use. Attention! : The screenshots are in Dutch. The options are probably at the same place in the English version. Our apologies for the inconvenience. These are the outlines of the shape you want to cut. They consist of paths or shapes. The stroke weight has to be Hairline and the color RGB red. Make sure the color model is RGB. 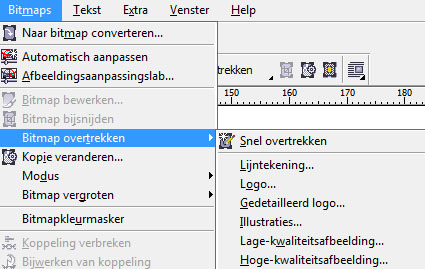 You can download the correct swatches that can be imported to CorelDRAW here. This is the same as for cutting. The cut is not through and through. This leaves a drawing on the material. The stroke weight is also Hairline. 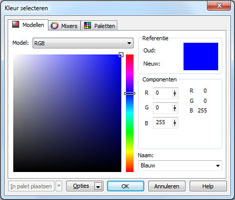 De color is RGB blue which is also available in the color pallet. All fills are engraved. By using shades of grey you can control the density of the engraving. 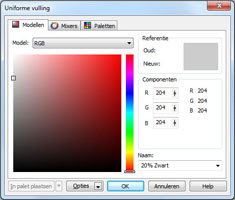 On average light grey (RGB – 230,230,230) is the shallowest and black the densest. All shades of grey in between make a difference in density. Gradients can also be used and are treated the same way by the machine. Rasterized or bitmap images can only be engraved. If you want to cut or vector engrave them, you need to convert these images (JPEG,BMP, PNG, etc.) to vector line drawings. Attention! : The original bitmap is still behind the traced image. Delete the bitmap before sending the file. Cutting lines have to be RGB red with a stroke weight of 0.01mm without any fill. Vector engraving lines have to be RGB blue with a stroke weight of 0.01mm without any fill. For more details see the cutting or engraving part of this tutorial. It is possible to cut or engrave text. The only thing you need to do is convert it to outlines. This way the font is converted to paths and will keep its appearance. Attention! 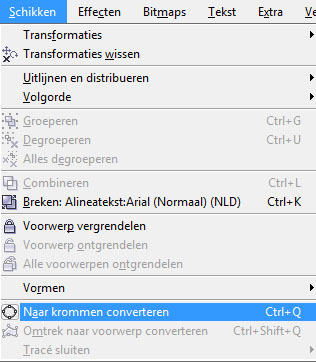 : Do this step in the end of the process because you cannot change the text after this step. Cutting lines have to be RGB red with a stroke weight of 0.01mm without any fill. 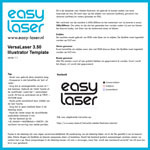 Vector engraving lines have to be RGB blue with a stroke weight of 0.01mm without any fill. Engraving can be done by not using a stroke and only use a greyscale to black fill. For more details see the cutting or engraving part of this tutorial. The laser cutter optimizes the cutting process. It is not necessary to manually give in the order in which the machine engraves or cuts. It automatically first cuts the smallest parts and works its way to the bigger parts. For example, black is deep engraving, red is shallow engraving, yellow are the inner cutting lines and blue the outer cutting lines. 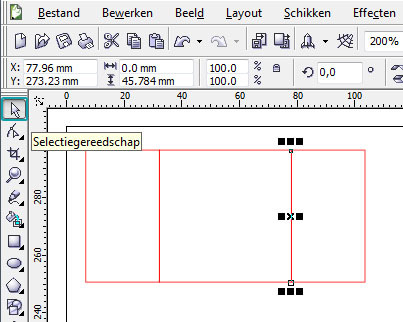 It’s possible your drawing consist of double lines after importing an illustrator EPS. They lie on top of each other and are hard to notice. These lines look darker than single lines. Delete one line to see whether there is another one underneath. If this is case you also need to delete the rest. Double lines take longer to cut, cost twice as much, leave a bigger burn mark on the edges and damage the cutting table. So please check this to be sure the material is not cut twice. A more common problem is shapes that have one shared side. For example two rectangles that are drawn against each other. This is also cut twice and results in a lower level of precision and bigger burn marks. You can fix this by selecting the one the objects. 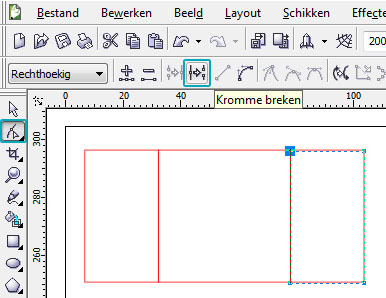 Use the shape tool to select the corner of the shared line. 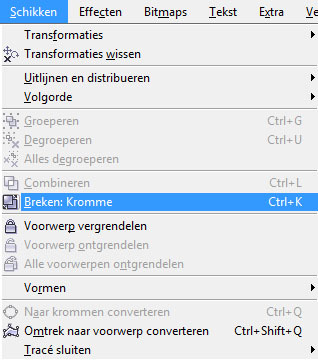 Click kromme breken (break curve). Repeat this step also for the other corner. 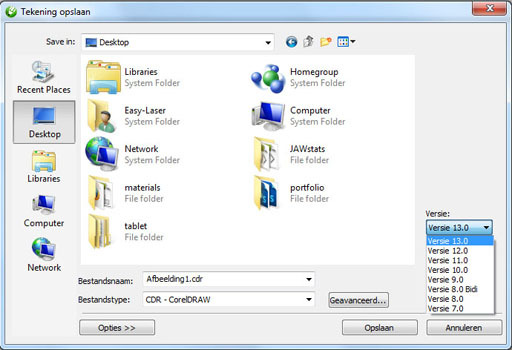 Use the selection tool to select the line and press Delete once to delete the line. Repeat this process until all shared lines are removed. We use CorelDRAW X3. Please save your file as a CorelDRAW 13.0 file. Congratulations! Your file is ready for cutting. 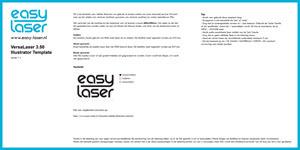 Send your file to info@easy-laser.nl to get a quote by email.